You were born and raised in Madeira. How did this influence your architecture? This condition of mine, of setting roots onto an insular place in the Atlantic, invokes an experience of proximity with nature, marked in two times. A first one, unattached, in a superficial glance, but not necessarily insensitive and appealing. It builds a way of seeing… as a simple fact for a physical place… Another time, on my return from graduation, by revisiting the island with a new viewpoint, which positioned a new form of acting, building a conscience of compulsion towards the analysis and reading of a totality, the one of territory, and towards building with architecture. All of these experiences rapidly made me understand (although in a slow reading process) the richness and form in which man has continuously transformed this place. Even nowadays it is possible to see the different layers built up over time in this insular territory, including what is beyond human presence, building towards the value of a complex human reality filled with ideals and bonds. This knowledge has always been through transformation, by contrasting the pyramidal shape of the island. Structural elements have been made following the natural shape with similar materials. It is built with the same material found locally. Almost like a rudimentary gesture that I like to focus on and which supports my formal project operations. This radical touch (close to the roots) that creates a platform for life in this island throughout the times. Working in Lisbon with Gonçalo Byrne you had the chance to develop some projects on Madeira as well. Do you credit your ten years’ experience with Gonçalo Byrne for laying so much importance to the place? The duality of experiences between the island and Lisbon, and in its differentiation of contexts, contributed to my experience of lightly touching the place, the slow, prolonged reading that has become essential to me, in a learning process. Visiting the place “at sun rise”, capturing its precious profiles. The physical support gains contours and highlights the “Living Geography” (2), as Gonçalo Byrne aptly refers to it. It adds the value of history, the layers of time in this very place. Madeira’s rugged mountains and predominant Atlantic Ocean are in a constant dialog. How this relationship has influenced the architecture of the island? The immenseness of the ocean is omnipresent, it is something that clings, defines the soul of the island inhabitant, not only it draws its psychological state but also formalizes its constructions. I like to understand the dimension of this liquid space in history, as in the past, dangers came from the sea and the constructions had a character of defence: more enclosed. Several fortresses were built along the coast line. In another time, after this period, construction focused on seeing the ocean, as this was the gateway of the island, and several towers have been erected all over the city to “view the sea”, affording it a highly specific identity. Today, this liquid space can be read as a exercise in contemplation, also associated with touristic activity. In this confrontation of different times, the steep slopes that necessitate the supporting of the lands to promote life, and the memorial logic of observation establishes the understanding of a place, or more, of this place. What does the idea of insularity mean to you? How do you translate it in your architectural practice? It is interesting for me to understand the insular context not only as closed data, but also as a possibility for simultaneously observing phenomena of cosmopolitism and endemism. The island has always been a place of “contamination”, of stops between ports, of destiny for travel. The island hybridises with the outside world. Cosmopolitism and endemism are, thus, natural and cultural conditions of the island, and these are the basis where its constructions are made. It is this dialect between insularity and radical exposure that I like to act upon. Paradoxically, it was the geographical isolation of these places that enabled me to practice my profession in absolute tranquillity and embracing them as challenges – despite all the ups and downs and remoteness from outside influences. Although these conditions may seem “limiting”, they fashioned my architectural position. Perhaps involuntarily and often unknowingly, my practice has developed a clear and precise profile. But it also has flexible boundaries that are always open to new creative approaches. This displacement has not been a restricting factor because I am able to interact with a unique and exciting territory. Here, the geography, the topography and the manipulation of form are fait accompli; on Madeira I have been able to work on other expressions and other spatial dramatisations. The limited land, the latent predominance of water and an intense nature constitute the “dense matter” on which my projects are based. In a sinuous landscape, you choose to design geometrically precise volumes. Is this a trial to adapt it to human perception and scale? Curiously, Gonçalo Byrne defends the thesis that the nature of the island is so strong and radical that it surpasses any deviating value… being generous the statement, the physical changes are also data for me and are increasingly a theme addressed at the office. How can architecture be a vital union for recovering or establishing the value of extreme observation? The introduction or desire to tear and conquer time through expressways has turned into a sort of amnesia of the place, an effect of speed that now is experienced. Our concerns are based on how architecture can act as a platform to counteract the installed time, by creating a place to recover the gaze and reestablishing the landscape, a place which is simultaneously revealing the volcanic sinuous shapes of the island. What are the key features that influence your design process in this context? What matters for me is the materiality of the place as a physical support, as construction, but first and foremost as a contact point with the memory of this place. It is within this context that my projects are inserted. I would like to illustrate this with two projects: the “Casa das Mudas” Arts Centre, and the Atlantic Swimming Pools and Das Salinas Promenade. The first one is located along the rocky formations by the coast line and reacts to the natural depressions and roughness with the long and sinuous wall built from basalt. The most surprising characteristic of this coastal site is the sinuous shoreline, configured by the violent cooling of lava flows that deposited a rocky, rugged and porous massif that lends the plot a rare borderline balance between water and land. Working in such an extreme location, both beautiful and weathered by social and physical erosion, it was important to conduct a thorough examination of the site, stripping it down to its bare essentials. Time-honoured occupations that have survived at the site to this day, such as a highly artisanal codfish drying industry, which results in a product known regionally as “island cod”, and the salt mines in the rocky terrain from which the site – Salinas – would later take its name, lend the location an easily recognisable sensorial dimension. The second one is built on top of a cliff, using it as its base, and built as if it were part of its mass due to the integral and total coverage with basalt stone. Extremely high mountains orographically define the district where the Arts Centre was built, with its urban area set in the deepest valley. By implanting itself on the lineal peak of one of these mountains, which ends abruptly with the sea, it seeks to redesign the “mountainous mass”, acting as topography. The intense predominance of the Atlantic Ocean, the rugged, layered escarpment that juts into it, the pebble beach and the presence of agricultural plots, the faces of the fisherman, weathered by hard life at sea, and the breathtaking views that unveil the idiosyncrasy of this place. The intervention uses some of the existing features and extends the compositional principles of the site, in line with the island’s territorial tradition, with the operation achieving definition in successive walls and platforms, creating an area that can be perceived as an accessible entity, visually and thematically connected. The project strove to act on and articulate different aspects, layering the programme and allowing for autonomous functioning while reducing the overall impact and interweaving the horizontal and vertical fluxes. It creates a circuit of walkways, giving continuity to an old ocean-side path and the town bulwark and articulating it with a coastal trail. The complex succeeds in overcoming the difference in elevation between the upper and lower levels of the intervention, taking full advantage of the sea views. A long, high wall delimits and articulates Das Salinas, maintaining a constant dialogue with the sea. This thickset wall softens and shores up the steep embankment. Not only does this serve as a stabilising buttress – it also houses all of the programme’s seafront facilities. This volcanic stone wall, highly reminiscent of those used in the local agriculture, gives the landscape a humanised feel. In opposition to the wall, a geometrically precise swimming pool sunk into a concrete solarium platform that fills the most expressive concavity not only relates to the sea, but actually accentuates it, by countering and contrasting the jagged irregularity of the rocky massif. The entire project is an attempt to conjugate the various horizontal and vertical fluxes that complement the site, making it stand out and rendering it more accessible and inviting, structuring a public,open space into an existing and at the same time new landscape. The Casa das Mudas Art Centre is a powerful building at the top of a promontory, silently occupying the space between earth, air and ocean. Sculptural and built of basalt, it merges into the geology and creates a landscape, a new vantage point for fresh interpretations of the immensity of the sea. Confronted with creating an Arts Centre, in the intensity of a rural landscape, with the insular, ancestral desire to observe the sea, this building was designed. By implanting itself on the linear peak of one of the mountains that defines Calheta’s Valley, which ends abruptly with the sea, the building seeks to resign the “mountainous mass”, acting as topography. Its interiority and complexity is only revealed when the visitor is close to the building. A sophisticated, mineral platform underneath the Casa das Mudas covers the whole museological complex. A vitreous patio organises and exposes the programme. In its interior the patios and pathways cut, burrow and link all the functions, at times going against the environment, vertically in relation to the mountain and horizontally to the sea. The exhibition rooms, of varying dimensions to allow greater amplitude of use, and which appear in series, reducing their design to the minimum, camouflaging the entire technical infrastructure, in a way that the work of art is the core element of the visit. In contrast, the auditorium presents a detailed and affirmative design in order to provide maximum value as a space for shows and to allow a wide variety of programming. Paulo David (Funchal, 1959) received his Architecture Degree from Faculdade de Arquitectura, Universidade Técnica de Lisboa. From 1995 to 2002 he was a project Consultant for the Historical Centre Proposals in Funchal’s City Hall. He was a visiting Professor at Madeira University (Art and Design, 2001-04 and Civil Engineering, 2006-09) and a member of its Culture Council (2012-13). He was also an invited professor at Universidade Autónoma de Lisboa (2009), Universidade de Sassari in Alghero (2014), Universidade Católica in Santiago Chile (2015) and Politecnico di Milano (2016). 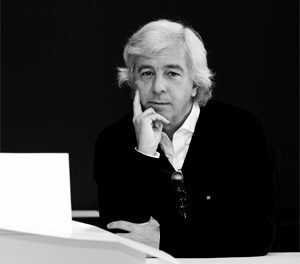 Paulo David has been awarded several prizes, such as AICA Prize (2007), Alvar Aalto Medal (2012) and Comendador da Ordem do Infante D. Henrique (2012). He is the author of “Street Corner Meetings” and “Let’s Talk About City”, and his work has been published and featured in several exhibitions in national and international ranges.